Current simulations of material deformation are a balance between computational effort and accuracy of the simulation. To increase the accuracy of the simulated material response, the simulation becomes more computationally intensive with finer meshes and shorter timesteps, increasing the time and resource requirements needed to perform the simulation. One method for improving predictions of brittle failure while minimizing computational overhead is to implement statistical variability for the material properties being simulated. This method has low computational overhead and requires a relatively small increase in resource requirements while significantly increasing the precision of simulation results. Currently, most simulation frameworks inaccurately describe brittle and heterogeneous materials as uniform bodies of equal strength and consistency. This over-simplification underscores the need to implement statistical variability to help better predict material response and failure modes for materials that contain intermittent abnormalities such as changes in hardness, strength, and grain size throughout the specimen. Uintah, the computational framework developed by the University of Utah’s C-SAFE program, has a simplistic native Gaussian distribution function that was hard-coded into select material models. The goal of this research is to create an easily duplicable method for enabling dynamic global variability according to a Weibull distribution in constitutive models in Uintah and to implement said ability into the constitutive model Kayenta. The main application of Kayenta is to simulate geological response to penetration and perforation. 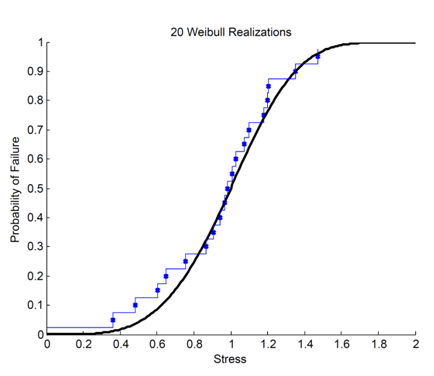 For the purpose of simulating failure in brittle geological samples, the Weibull distribution produces realistic statistical scatter in constituent properties that correlates well to flaws and irregularities observed in laboratory tests. This entry was posted in Projects, Publications, Research and tagged accuracy, computational, deformation, failure, heterogeneity, laws, material, models, penetration, research, simulation, staistics, statistics, Uintah, undergraduate research, variability, Weibull. Bookmark the permalink.